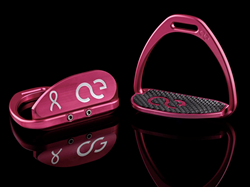 American Equus, the innovative manufacturer of stirrups, spurs, and horseshoes has pledged to donate all sales of their Pink Special Edition Thoroughbred Racing Irons and 10% of total sales for the month of October to help find a cure for breast cancer through their Gallop for a Cure campaign. By raising awareness and funds to the Breast Cancer Research Foundation, American Equus hopes to support the thousands of men and women who are affected by this disease annually. "Breast cancer is a disease that has negatively affected almost every family in America," remarked David Shano, Founder, and CEO of American Equus. "It is our sincere hope that we can rally our extraordinary network of customers and Chosen athletes to encourage people to donate to the Breast Cancer Research Foundation in order to one day eradicate this disease that claims too many lives each year." One way that American Equus is choosing to draw awareness to the cause of breast cancer research is by outfitting ten of the fourteen jockeys in the Grade 1 $1,000,000 Jockey Club Stake race that is part of Super Saturday event presented by the New York Racing Association (NYRA), with their signature pink Teardrop Racing Irons that feature the breast cancer ribbon. The jockeys, who will also wear pink racing silks, will be the representation of the racing industry's commitment to breast cancer research. The event, that will be broadcast on NBC Sports from 5pm-6pm on October 8th, will be donating a portion of the proceeds from each ticket will be donated to Winthrop-University Hospital's Breast Health Center. "I think that the irons will be a great way to help our Chosen Rider's participate more directly in the spirit of Super Saturday," said Shano. "We also wanted to make a more direct impact breast cancer awareness, so after a considerable amount of research, we decided to align our efforts with those of the Breast Cancer Research Foundation. They have such a great track record of putting donation dollars to work and American Equus is looking forward to being a part their efforts to eradicate breast cancer in the future." The Breast Cancer Research Foundation (BCRG) is a nonprofit organization committed to achieving prevention and a cure for breast cancer. Founded in 1993 by Evelyn H. Lauder, BCRF has raised more than half a billion dollars for lifesaving research and treatment solutions. With an "A+" from CharityWatch and a 4-star rating from Charity Navigator, BCRF is one of the most effective nonprofit organizations in the United States. Please click here to be a part of the American Equus effort to help lifesaving solutions to man and women who are afflicted with this disease. To learn more about the Breast Cancer Research Foundation,click here. To learn more about American Equus,click here.